The demand for a commodity may change without change in price but due to change in other factors. It is called rise and fall in demand. There may be change in demand due to change in population, change in taste of people, change in distribution or change in quantity of money. There is rise in demand of a commodity. The consumers were buying 10 kilogram rice at rate of $10 per kilogram. The demand of rice increases from 10 kilogram to 15 kilogram and price of rice remain the same. The following table shows the rise in demand. The diagram shows rise in demand of commodity. Quality of demand is shown on OX axis. The price is shown on OY axis. DD is original demand curve. Price is same but demand rises. 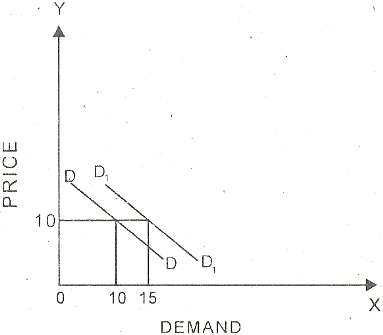 The demand curve moves from DD to D1 D1. There is rise in demand when consumptions of commodity remain the same but there is increase in price of that commodity. The consumers were buying 10 kilogram rice at the rate of $10 per kilogram. The price of rice increases from $10 to $15 per kilogram. The consumption of rice remain the same at 10 kilogram. There is rise in demand in this case. The diagram shows rise in demand of commodity. Quality of demand is shown on OX axis. The price is shown on OY axis. DD is original demand curve. Price increases but demand remains the same. The demand curve moves from DD to D1D1. There is fall in demand when consumption of a commodity falls but price of that commodity remains the same. The consumers were buying 10 kilogram rice at the rate of $10 per kilogram. The demand of rice falls from 10 kilogram to 5 kilogram and price of rice remains the same. The following table shows the fall in demand. The diagram shows fall in demand of commodity. 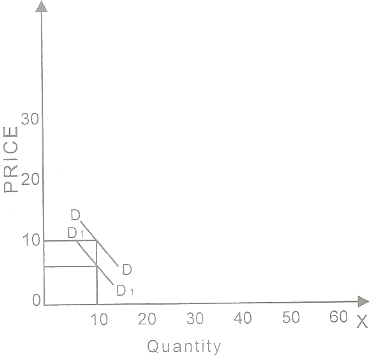 Quantity of demand is shown on OX axis. The price is shown on OY axis. DD is original demand curve. Price remains the same but there is fall in demand. 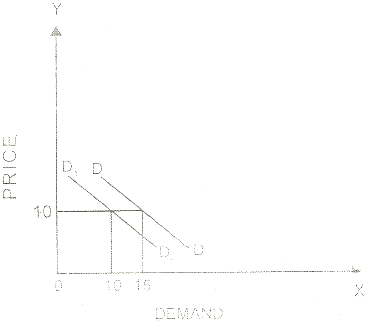 The demand curve moves from DD to D1D1. There is fall in demand when consumptions of commodity remain the same but there is decrease in price of that commodity. The consumers were buying 1kilograms rice at the rate of $10 per kilogram. The price of rice decreases from $10 to $5 per kilogram. The consumption of rice remain the same at 10 kilogram. There is fall in demand in this case. The diagram shows fall in demand of commodity. 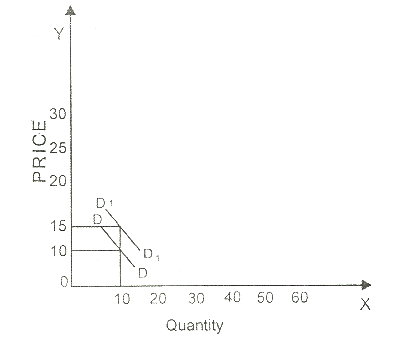 Quantity of demand is shown on OX axis. The price is shown on OY axis. DD is original demand curve. Price decreases but demand remains the same. Te demand curve moves from DD to D1D1.